“Having Down syndrome makes the world happy,” says Bridget Brown, 32, who wears about five different hats phenomenally well. Bridget is a public speaker through Butterflies for Change, an organization founded 15 years ago by Bridget and her mom, Nancy. 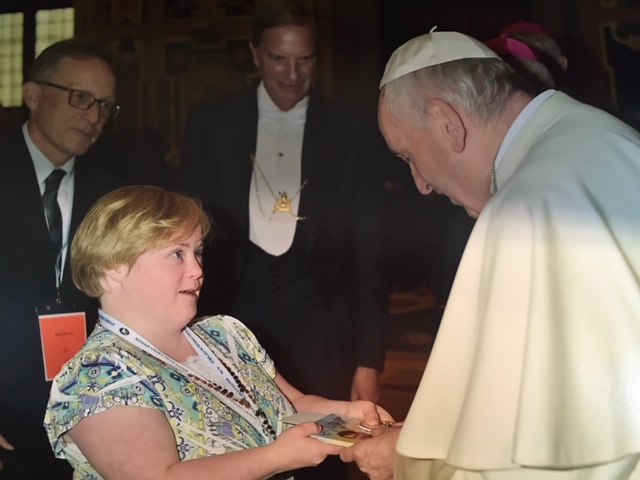 Bridget has spoken to thousands about “what it is to live a successful life in a community,” and even had a personal audience with the Pope in 2017, when she was invited to Rome to take part in a conference initiated by Pope Francis about the engagement of people with disabilities in the daily pastoral life of the church. “Meeting the Pope was exciting to me! The most important thing to know is that he has helped with the dignity of people with disabilities,” says Bridget, who delivered two letters when she went, including one she wrote regarding the people of Iceland, where babies with Down syndrome are now killed at a rate of 100 percent, and another from a friend, advocating for the inclusion of children with disabilities in Catholic education. So how did Bridget go from high school graduate to traveling the world and trading blessings with the Pope? First came the transition years. She says, “During transition, I attended TCD (The Technology Center of DuPage) and earned a certificate in Early Childhood Education. From there, I got a job working at a pediatric clinic at the University of Illinois at Chicago, where my dad works. She’s meeting these goals in variety of ways. What makes you happiest? “I am happy when I am with my family, especially when I see my nieces and nephews, and especially my baby nephew because he makes me laugh the way he walks and smiles. My favorite activity is to camp with my family. My most memorable trip was when we went to Colorado to see the Aspen trees and our oldest friend. We stayed in a yurt, and I got to speak at a convention.